Forget decorating a cake with fondant. Even marshmallow fondant, that tastes 100 times better than traditional fondant, isn't great. Unless you love circus peanuts. But that is beside the point. 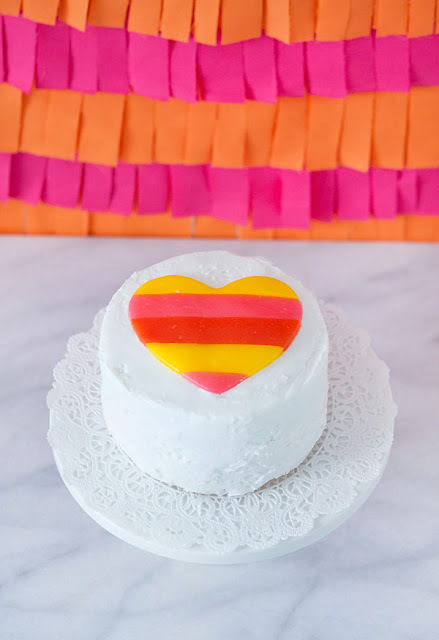 This fun DIY striped heart cake decoration is made from candy. Airhead candy to be exact. And even if you don't love airheads, you have to admit they taste better than fondant! And kids will LOVE it! Caroline has a great tutorial that will show you how to work with candy to create cake decorations like this Airhead valentine striped heart. You can check out the tutorial over at Armelle Blog.